"Since our foundation, the University of Surrey has been defined by the energy and determination of our people, and by service and education in our community. Our ambition is to be a leading research institution making great contributions to the economy, society and the environment. We have signed the Manifesto to publicly acknowledge our commitment to partnerships, community and collaboration. Our institutions have so much to offer – beyond our academic purpose, we are increasingly connected to life locally, nationally and globally. It is therefore a responsibility and a privilege to offer the benefits of our research to address the multiple challenges facing humanity in the digital age." Creating partnerships and fostering relationships: ensuring we have strong connections with organisations and individuals as an anchor institution in our local community. Engaged research making a local difference: creating opportunities for our research to positively engage and impact our local community. Widening Participation and Outreach: bridging the gap between school and Higher Education, raising aspirations among young people. Volunteering: acting as a hub, ensuring we are a valued partner and provider, having a positive impact on our local community. Events: involvement in a diverse programme of events and sponsorship, to engage and inspire – taking the University to the public and vice versa. Meaningful communications: ensuring a two way dialogue. This includes mass communications in the form of our bi-annual community newspaper, social media and listening to the local community through our annual local residents’ survey and regular stakeholder engagement. Taking responsibility: working collaboratively across the University to listen, understand, mitigate and improve the University’s impact on the local community. Researchers from the Global Centre for Clean Air Research (GCARE), along with Guildford Borough Council and University of Hasselt (Belgium), are engaging Guildford residents in a local air quality project. The iSCAPE (Improving the Smart Control of Air Pollution in Europe).project is integrating and advancing the control of air quality and carbon emissions in European cities through the development of sustainable air pollution remediation strategies, policy interventions and behavioural change initiatives. The overall aim of the study is to investigate how customised information can influence individuals to make more pro-environmental choices in their transport, travel and commuting. 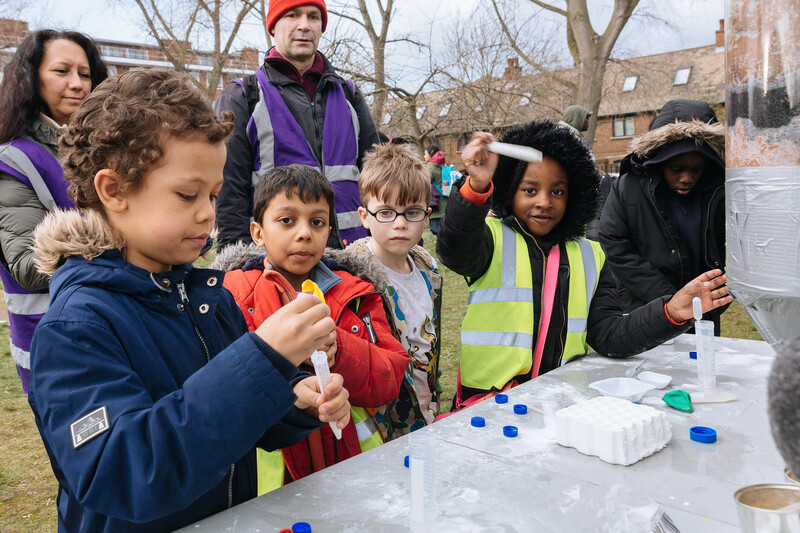 Researchers are using a combination of questionnaires, workshops and sensor technology citizen science to record local pollution levels, map travel behaviour and educate the local community on their exposure and ability to reduce air pollution. "We are leading the way on global air quality research, and we want the community in our hometown - Guildford to be a part of this too. This initiative will help improve the understanding of Guildford residents on the impact of their own travel and how changes they could make can have a positive outcome." We are actively engaged in developing our role locally as an anchor institution. For us we’re not interested in empty rhetoric, but are committed to tangible life changing engagement with our local community. As an institution we strongly feel that it’s really important to be self-critical and always challenging ourselves to do better and avoid any notion of being self-centred about how good we are and resting on our institutional laurels. One example of this is how we are tackling the issues we have created through our own success. As a growing institution we acknowledge we have both positive and negative impacts on our home town of Guildford. Whilst we’re immensely proud of the economic, knowledge based and social benefits locally, we know that our institution of our size brings challenges around housing, infrastructure, sustainability and environment to our local community. To that end we have set ourselves the target of being a better neighbour and the most engaged civic university that we can be. We are working on a nucleus of locally engaged projects for the benefit of our home town. These are based around our own skills and expertise in research and community led activity that work to benefit the society around us, through dealing with variety of issues from environmental to social. Jim Al-Khalili is a vocal advocate for public engagement in science and is an active member of the Universities Public Engagement Forum and regular participant in local engagement activity. Despite his profile as a public scientist, Jim continues to teach undergraduate physics and carry out research. Jim is a well-known science communicator, author and broadcaster. He has written eleven popular science books, between them translated into 26 languages. Jim is a regular presenter of TV science documentaries, including the Bafta nominated BBC series, Chemistry: A Volatile History. But he is probably best known as presenter of the weekly BBC Radio 4 programme, The Life Scientific. "I’ve always liked explaining concepts in non-technical terms – which probably began when I was sitting in the pub with my friends, most of whom weren’t scientists, and trying to tell them about my work." "Alongside my career as a researcher I did radio interviews and schools talks which I very much enjoyed, but it was never my plan to become a broadcaster. Then in 1997, I was chosen to give the Institute of Physics’ schools and colleges lectures and, on the back of that, I was asked to write my first book (on black holes) and found I enjoyed writing. The TV work with the BBC started about 12 years ago and has been great fun."